I'm posting this here more as proof of life than anything else as 'real life' continues to demand so much of my time. This was my entry for the latest bonus theme round, ‘Hot’ – after all what could be hotter than Hell? This then is a ‘Heresy Miniatures’ Azaroth the Fallen One, another stunning sculpt from the very talented Andy Foster. 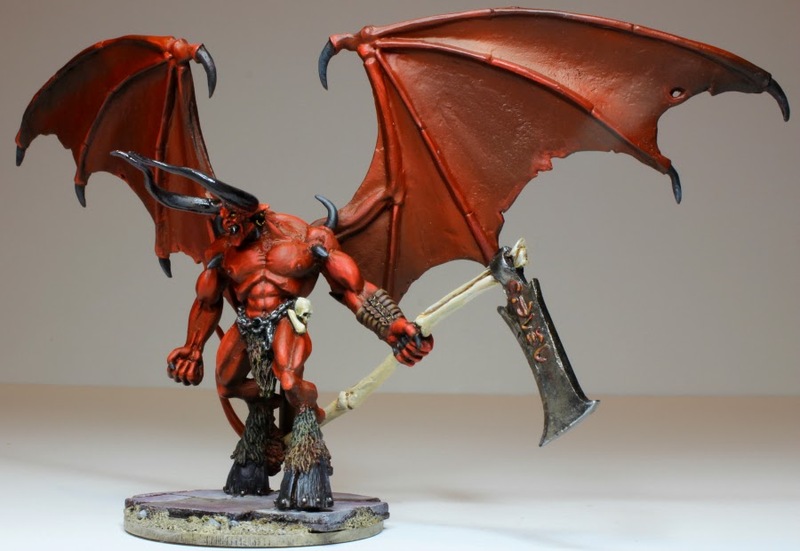 I think that it is fair to say that I have a problem with Heresy Miniatures, they are just far too tempting! This particular purchase was justified, albeit tenuously, as a possible representation of Lucifer himself in my ‘Witchfinder General’ scenarios – that and it was in the sale, what was I to do? Just as the ‘Jabberwocky’ in the previous post this large piece of metal required a substantial amount of pinning and filling just to get the basic body assembled and then there were the wings! These was a real concern, with their span considerably greater than the model’s height, I was starting to worry that my ‘Warbases’ 50mm MDF disc was going to be too small. Fortunately the design of the sculpt is so well proportioned and balanced that it stands comfortably and whilst not the most stable model in my collection it certainly won’t be blown over either. Once assembled, the now familiar form of the shiny new airbrush again graced my corner of the dining room table and several progressively brighter coats of colour were added to give me a base to work on. Once completed additional highlights and details were applied until I was happy that I had done justice to this fine model. It was at this point that a curious thought entered my mind, perhaps ‘Old Nick’ was paying a visit on someone, but who could it be? A quick rummage around the lead hillock saw me discover a hitherto unopened bag of Benedictine Monks from ‘Conquest Games’. My eyes immediately fell upon the chap with his head in a book; perhaps oblivious to what was behind him? The monk, not providing me with the most taxing of decisions when it came to colour palette, gave me the opportunity to link the two together with the deliberate decision to paint the cover of his great tome red, but what was he reading? Initially I thought that he might be reading some form of arcane incantation to protect himself from the Dark Lord behind him, but what if it were something more illicit? Perhaps a rediscovered digest of forbidden images? Suddenly I had it, three saucy Succubi! Yes another order to ‘Heresy Miniatures’ and vision was complete. 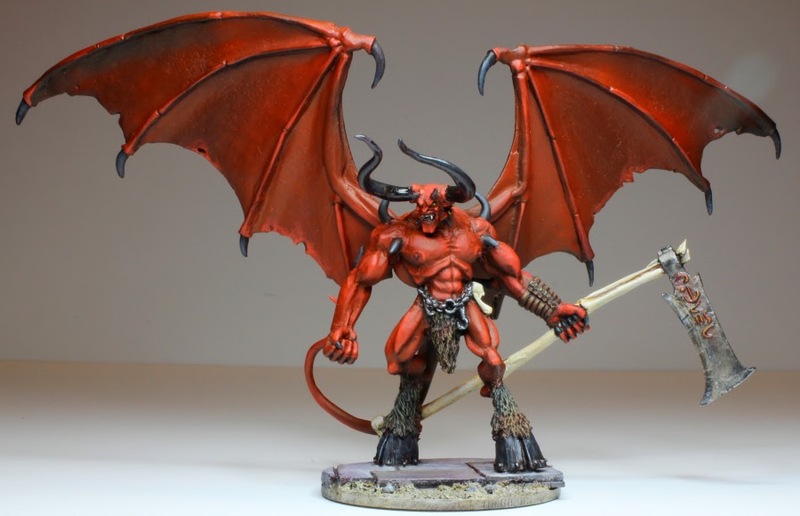 These lovely ‘ladies’ were give a similar paint job to our cloven hoofed one and with the addition of a ‘floating’ base that matched that of Lucifer's, I was able to create some form of narrative to this latest theme round, entry to the 'Analogue Hobbies Painting Challenge'. Although my own production and posting rate has dropped off recently do please take the time to have a look, and of course vote for your favourite entries, here. Just remember, someone is always watching you! Stunning painting as ever Michael. I have that model coming from the heresy kickstarter and I will be pleased if mine is half as good as that. Thank you Mike, I'll certainly be interested to see the results of the Heresy Kickstarter. I was sorely tempted, but in the end didn't as I prefer the metal casts at the moment. Thank you Tamsin, Old Mick, certainly has a ring to it and I definitely feeling that way at the moment. I say the monk is reading 50 shades of grey ... I mean red. Awesome job as always Michael, loving the red blends. Now there's an idea, although not a novel I shall be rushing out to read anytime soon. You've definitely gone up in scale with your recent miniatures – lovely looking stuff. Glad to see you're still upright… was getting a touch concerned with the lack of posts. Thank you Mike, it might have something to do with my failing eyesight! Still just about upright, although all vert trying at the moment. Thank you so much J.D. Sorry that I have not been around recently. Not sure that I'm quite ready for that yet, but you have certainly been an inspiration Mr. Lee. By the way, lately Satan is ripped. Thank you very much Luis! It would certainly appear that Satan has the same chocolate temptation as me judging by his muscle definition. Super nice handling of all of the red color in this vignette. Thank you Jay, although I was certainly seeing red when the wings wouldn't stay attached! great work with the colours and great idea for the general display. Thank you Luca, I was really pleased with how it all came together, quite a journey of discovery. Thank you so much, that is incredibly kind of you! Fantastic Work Michael love it! Your certainly getting the hang of that airbrush! Thank you Simon, the airbrush is certainly great fun to work with on the larger models looking forward to having a go with some terrain pieces later on. What a magnificent beast! Brilliant paintjob Michael. Love the succubi too. Thank you so much Bob, the succubi were a fabulous find! 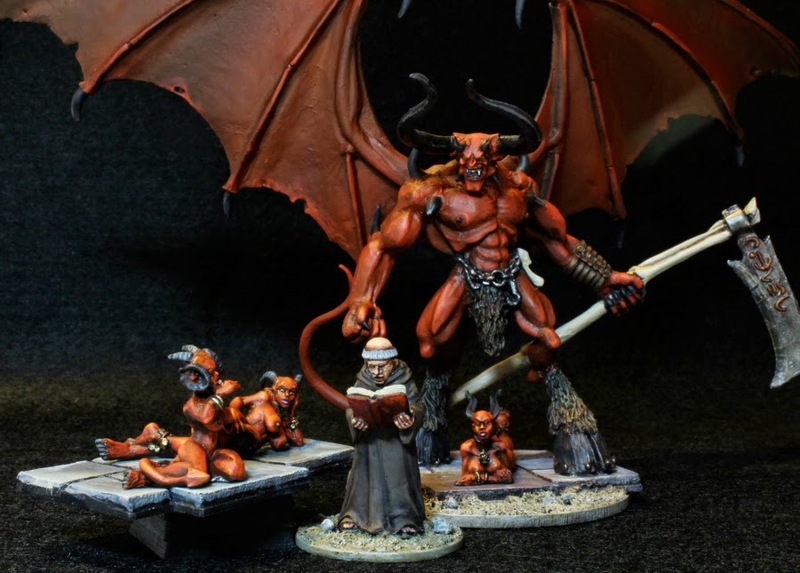 Wonderful work one these fearsome models! Stunning. Nice to see you are getting your monies worth from the airbrush. Thank you Mark, I must admit it is proving to be a great distraction. Really stunning work, Mr Awdry - speaking from experience, red is hard to get right, especially over large areas, but you nailed it! Thank you so much Ev, there are certainly are fair few layers involved in this, so I was pleased with how it turned out. My word Mr Awdry another work of pure pleasure to my eyes. Thank you Dan, a pleasure to work on too. Simply outstanding Michael! This figures have it all: ´eavy metal,nasty "chix" and a lot of humour. :) I really like the pictures too!!! Thank you so much, I have to confess that I enjoyed putting him together. Stunning work once again Sir M, you're setting a pretty high goal for the rest of us! That's really kind of you Ray, but it's the standard of the rest of you that drives me on. Great job Michael, I really love this work! My favorite shot is the monk and the Succubi. A picture is worth a thousand words. Thank you Monty, but not so sure about that myself, you don't hear all the cursing and swearing it takes to get them here! I did wonder what had become of you ;) Great work on these figures, sir! Still plodding on, but device is somewhat disrupted at the moment. Thank you very much Mr. Finch. Great job. These are really fun choices. Thank you, I must admit I do like to mix things around, unfortunately these means that I rarely finish anything! Did you do some of the work with your new airbrush gun? Some of the pictures look like that. Thank you Stefan, yes the airbrush was used to build up the first three layers of colours and then it was back to the brush for the final highlights and details. Excellent start into aribrushing though! Thank you, I must admit I do enjoy working with the airbrush, not sure how much use it would be on smaller scale miniatures though? You are a splendid chap Mr. Docherty, thank you. I too like Heresy figures. Got a couple in one of my many boxes, but certainly not this fellow! Excellent work on him Michael, as well as the saucy Succubi. They are wonderful things these Heresy Miniatures and thank you! Thank you Pete and he certainly is a big chap, the wings proved to be quite a challenge. Thank you so much Cory. Very cool! Love the concubines! Thank you, they were one of those 'must have' purchases. Don't know where I was missing this one; but amazing group for this entries. I do like the lady devils - not only your wonderful painting, but their poses are so realistic. Thank you Dean, the Succubi were a great find and certainly helped to bring the piece together. Fantastic entry... and ver sorry for beating you to the 2nd place... I think your was the better entry! That is very kind of you and no apologies needed, all the entires were superb especially your Balrog. Just pleased to have got placed.